Mate, I reckon that one might be an FM lure from Palmerston NT. Is it 5" long, timber with a sort of angled cut tail? Some also, like the one I have, FM Lures hand-written under bib. Do you know how long the FM lures were made for? The ones I've seen seem to have a fair bit of age to them. Mate, as far as I can recall (mind going), they were made for a short period during the mid 80's. A good mate put me onto them, still have a black/silver and a card somewhere. I'll dig both out in the near future and post a new topic under NT lures for you all to see. Have a few other NT makers I'll post up as time goes by. These were all aimed at the local barra, so probably a small number at the time on the market. Don't forget, in those days it was Nilsies or nothing, until the Aussie makers came on the scene. Thanks Tony, I look forward to looking at them when you get a chance. Hey Tony the lure is 4 and a half inches long it has no writing on the bib , but the tail is cut on a angle.I thought it was a Dempster because there is a lure like it in the QLD lure section under George Dempster. No mate you have an FM there, distinctive paint pattern on sides in all the ones I have seen. Must drag mine out and take a pic, been a bit busy of late. Thanks for you'r help Tony cheers Sticko. A good friend's father used to make these lures, FM stands for F@&$:!g Magic. My friend's Dad died many years ago. We were out fishing today and talking about the need to get a bio up on this site, I will compile something and upload it soon. These lures look cool....will be good to learn more about them! 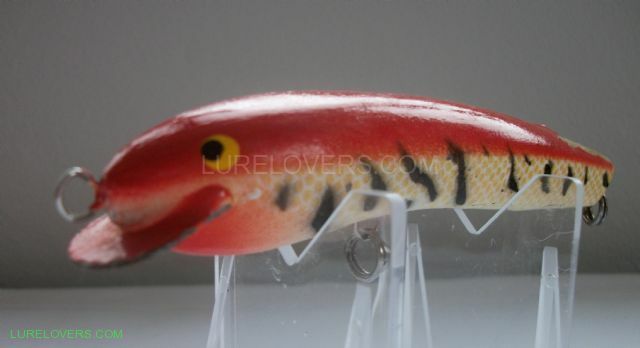 I don't recall the guys names who were making the FM lures, when they were making them they had a small shed in towards town, they had a rough copy lathe to turn the blanks down out of stock that was fixed in place. The copy lathe they used was originally made by a Chinese man who owned Yees Hobby shop in Darwin, he was a pretty clever bloke with a lot of gear but couldn't be persuaded to build seperceded models. Anyway when the FM lure blokes sold the copy lathe to another person, he added a heap of improvements to the machine for both accuracy, speed & safety, but to my knowledge he didn't go on with making lures or selling FM's lures & or his own patterns, its still out there somewhere waiting to be snavelled by another lure maker, you still see the odd FM lure floating around, cheers Balls.